It’s 2008. 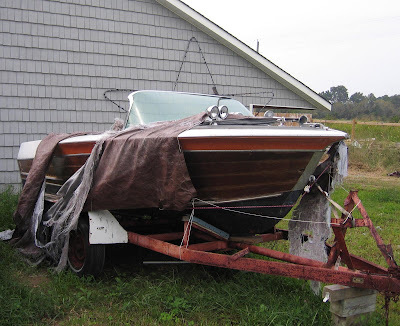 Please, this year be the year you save just one classic boat. I found this at a home for sale. The owner had just passed away, and was no doubt turning in his grave knowing that his baby was not being taken care of. Ahhhhhhhh fortunetly the boat had just been purchased and was been wisked away to her new home. Chris-Craft Described the SP-25 As "The Finest, Fastest, Most Luxurious Runabout Afloat"
Ya know. I get the newsletter, and forgot..I will post the link on the side here.. Thanks..
Folks, these old boats won’t be around if WE don’t save them. If you are up to a challenge, I can’t think of a more rewarding one than finding one of these treasures and bring it back to life to enjoy yourself and preserving its history for the next generation. Just DO it!! !